If you are a standalone user working with a studio, verify that you are using the same version of Harmony as the studio. Harmony boasts a 64-Bit engine, allowing you to export content faster, including elaborate scenes, large bitmaps, gradients and complex backgrounds. Users can output sophisticated scenes with particles, complex effects, as well as 2D-3D integration. Some modules are still running on a 32-bit engine. Therefore, you will find both win32 and win64 in the program's folders: Configuration Wizard, Configuration Editor, Media Server, Control Panel and TWAIN. There is a new option available in the advance Add Column dialog box, which serves to link your new column to an existing folder within the Element folder. 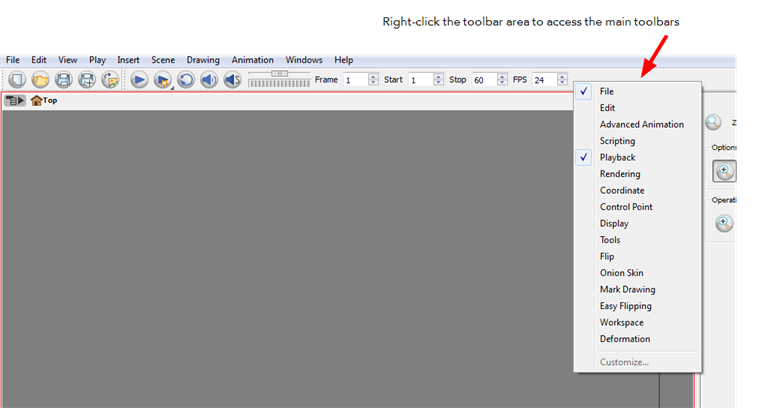 You may right-click anywhere in the toolbar area to access Toon Boom Harmony toolbars. View toolbars, however, are not available by right-clicking the toolbar area. 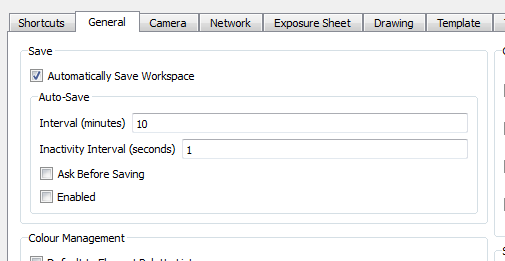 You can access the toolbar of any open and active view by right-clicking in the workspace area. You may also hide a portion of a toolbar by dragging another open toolbar over its tail-end. There is now a Zoom preference that can be set from the Preferences panel under the Drawing tab. ‣ From the top menu, select Edit > Preferences (Windows/Linux) or Stage > Preferences (Mac OS X). • Enable Paper Zoom: Enabling this option allows you to set the 100% Zoom level onscreen, in order to physically match the measurements of your paper drawing. • Number of Pixels per Inch: Enter the PPI for your monitor. To obtain the PPI of your screen, divide the height or width of your monitor's resolution setting by the corresponding physical height or width of your monitor screen (resolution height divided by physical height, or resolution width divided by physical width) in inches. • Maximum Zoom Factor: Sets the maximum zoom level for the paper zoom. • Magnifier Width: Sets the width of the Drawing Magnifier floating window. • Magnifier Height: Sets the height of the Drawing Magnifier floating window. • Magnifier Offset X: Sets the X-axis distance from which the Drawing Magnifier window floats from your cursor. • Magnifier Offset Y: Sets the Y-axis distance from which the Drawing Magnifier window floats from your cursor. • Magnifier Zoom Factor: Sets the magnification level of the Drawing Magnifier floating window. • Quick Close Up Zoom Factor: Sets the zoom level for the Quick Close up Zoom keyboard shortcut. The default shortcut is [Shift] + [Z]. As Seamless Bitmap: When selected, it composites all of the images into a single, flat bitmap image (just like the As Bitmap compositing mode). The main difference between the As Bitmap and As Seamless Bitmap modes is that the seamless version ensures that there is no visible seam between adjacent vector drawings that have matching geometries. This can be useful for cut-out animation, where multiple drawings may align perfectly like pieces of a puzzle. This can also be useful when building a 3D set out of flat drawings rotated in 3D. In this case, using the Seamless mode will produce the correct result when two drawings are either intersecting, or nearly intersecting, in 3D. Note that the As Seamless Bitmap mode does not support the following effects: Shadow, Glow, Blending and Focus. You can work with Autodesk Maya, PIXIE, or 3Dlight. For this guide, Autodesk Maya will be used. To work with PIXIE or 3Dlight, contact support@toonboom.com. There is now a preference that can be set from the Preferences panel, located under the Camera tab, that serves to wash out outdated previews. • Enable For Out of Date Previews: When you disable the automatic render preview, you need to click on the Update Preview button in either the Rendering toolbar or the Camera view bottom toolbar in order to recalculate and update the preview. When this option is enabled, if ever the current render preview is out of date and requires you to press the Update Preview button, the Camera view will display the current preview as washed out colours. • Wash Background Percentage: This is the value in percentage by which the outdated preview will be washed out. Harmony is no longer using ffmpeg to process the sound on Windows and Mac OS X. A new utility called Media Server is used instead. It processes the sound by using QuickTime libraries. Harmony still uses ffmpeg on Linux. The user has to install it himself, as for legal reasons it can no longer be packaged with Harmony. • There is a new shortcut available that serves to cancel an Auto-Preview and turn off the Auto-Render in the Camera view. The shortcut is called Cancel Preview, and can be found in the Preferences panel, under the Shortcuts tab, in the General category. The shortcut is unassigned by default. • In the Camera view, when a 3D object is selected, you can now see the different parts and textures faded with the selection colour, instead of a completely opaque selection. 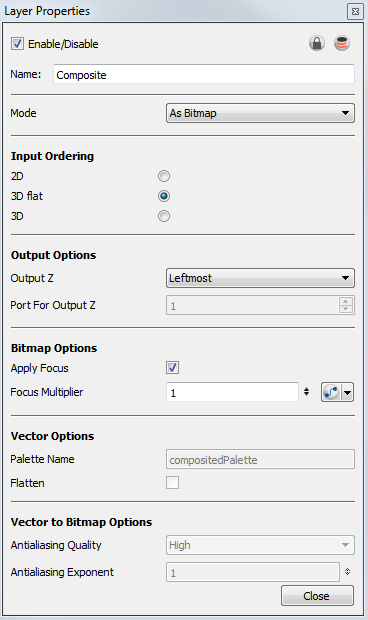 • When rendering a scene with 3D components, Harmony now supports the render with texture using PIXIE and 3Dlight. • Harmony now support Xsane drivers for scanners on Linux. • Harmony 10.0 comes with a new implementation and improvements of the shaders, especially for the Deformation technology. • The tooltip that appears when you hover your cursor at the top of each Xsheet column shows the absolute folder path to the source drawings for that column. There is now an Auto-Save feature which can be enabled from the Preferences panel under the General tab. In the Tool Properties view, you can now select the way pencil line tips will be affected when using either of the following tools the Cutter, Eraser or Ink tool. 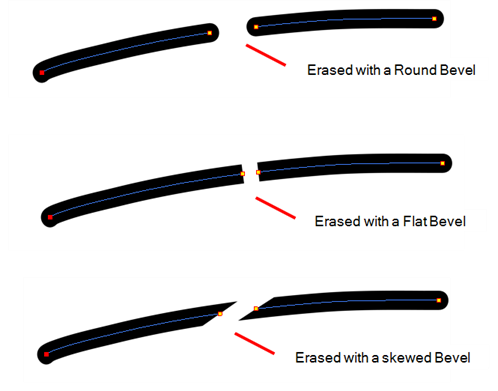 • Default Pencil Line Tip: Sets the default pencil line tip to either Round, Flat, or Bevel. Use the Ink Style option to customize the edge of the Ink tool. If you do not want to animate a drawing layer, you have the option of disabling its animation parameter. To do so, simply select the layer and in the Layer Properties view, deselect the Animate Using Animation Tools option under the Advanced tab. If your layer was already animated and you deselect the Animate Using Animation Tools option, your keyframes will be dimmed, enabling you to easily identify them as ones that cannot be modified. Select the option in order to modify them again. You may at times want to adjust your deformation animation using the drawing tools in order to perfect something, or add detail. You might also want to change the timing and set it on double frame, rather than single frame. Harmony offers you the option to convert your deformation animation to an image sequence. 1. In the Timeline view, select the deformation frame range for which you wish to convert to drawings. 2. 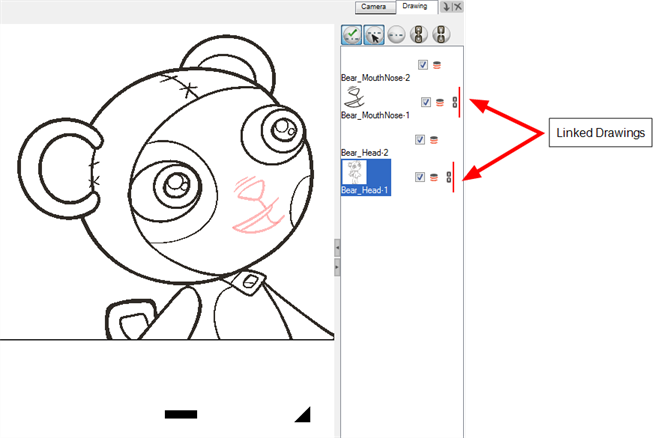 In the top menu, select Animation > Deformation > Convert Deformed Drawing to Drawings. The Baking Drawing process window opens. Wait for the baking to complete. Texture Resolution when Converting Gradient and Textures: This preference sets the size of the bitmap texture used during the conversion of deformed drawings to drawings. 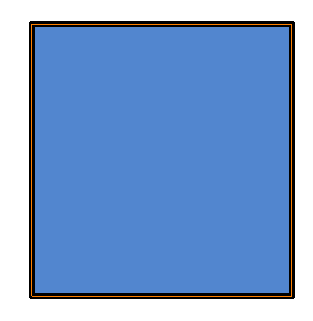 The maximum value accepted is 2048 pixels. The maximum texture resolution for Deformation Convert Deformed Drawings changed from 512 to 2048. The default value for this preference changed from 512 to 1024. 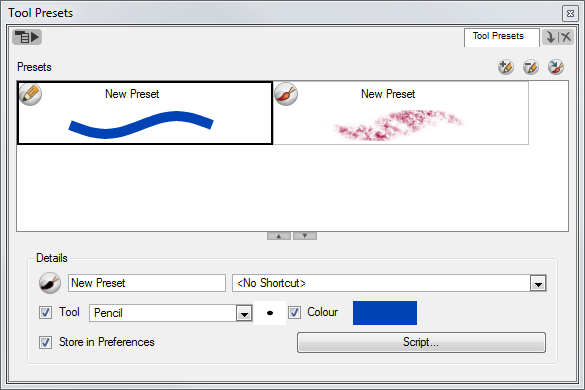 Create tool presets for 20 different tools, including the Paint, Polyline, Transform, Brush and Select tools. Define the colour, size and tool properties for the preset. Import a preset, or add a script, to have it perform specified actions. In addition, assign shortcuts for up to 10 of these presets. 1. 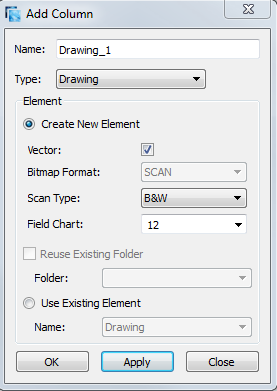 From the Tools toolbar, select a drawing tool. 2. In the Tool Properties panel, customize the selected tool. For example, if you have the Brush tool selected, you can tailor its maximum and minimum thickness, as well as assign a texture to it. 3. In the Colour view, create, or select, a colour. 4. In the Tool Presets view, click on the Create New Preset button, or from the View menu, select New Preset. The new preset appears in the swatch section of the Tool Presets view with much of its details filled in based on the information provided in the Tool Properties panel. 1. In the Tool Presets view, select the preset that you would like to delete. 2. Click on the Delete Preset button, or from the View menu, select Delete Preset. 1. In the Tool Presets view, select the preset that you would like to save. 2. Be sure that the Store in Preferences option is enabled (checked). 3. Either save your entire project, or from the View menu, select Save Presets. When you need to select all colour swatches but one, or select only a few swatches here and there, it might be faster to select the only colour you do not need, in order to select and invert the selection. 1. In the Colour view, select the colour swatch you DO NOT want to have in your final selection. 2. In the top menu, select Edit > Invert Selection. At some point during the production, you might need to export your sound file to use it in another application such as an editing software. Harmony allows you to export your sound files either as a merged soundtrack, or as a series of individual files. The exported soundtracks are generated as *.wav files. 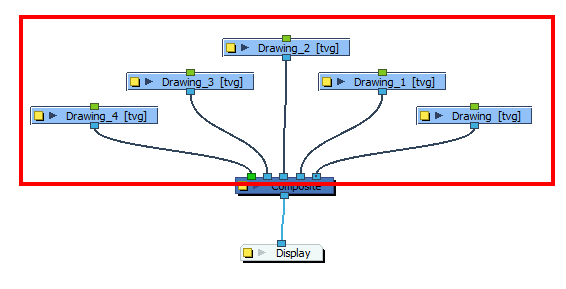 When using the Shift and Trace feature, you can link different drawings from the Drawing List so that they move together when dragging or scaling. 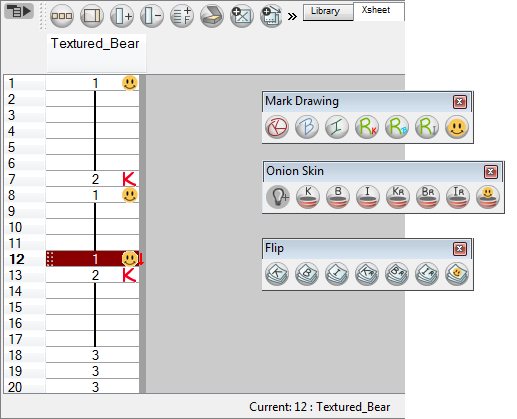 These drawings can be from different columns in the Xsheet view. 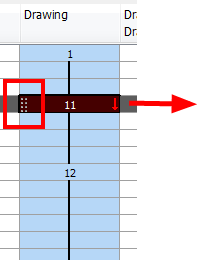 Bars in differing colours will appear beside the chain link icon to easily identify different linked groups. 1. 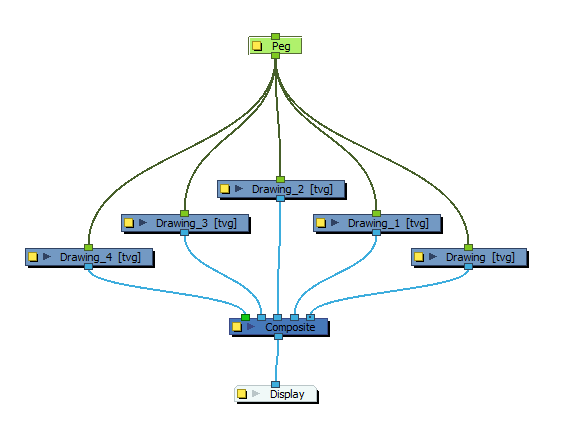 In the Drawing view's Thumbnail area, display the drawings you want to use to perform your Shift and Trace operation. 2. In the Thumbnail area, hold down [Ctrl] (Windows/Linux) or [⌘] (Mac OS X) and select the drawings your want to link together. 3. In the Thumbnail area's toolbar, click on the Link Drawings button to link your selection. A coloured bar and a link icon appear beside the linked drawings. Discover the new implementation of the QuickTime movie export in chunks when doing batch rendering. It now renders all the fi nal frames and then assembles them into a QuickTime movie. This makes the process more robust and assures the QuickTime render of a whole scene. This feature only works when connected to the database (not in Harmony Standalone). Use the Utransform utility from the terminal or the Unvectorize command from the Control Centre to convert *.tvgs to bitmap images, with the assurance that the fi les will be rendered using the associated palette-list. 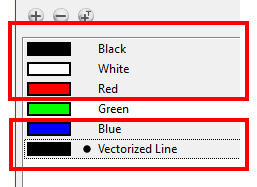 Where previously, even if zones colours were changed in a scene, if no new marks were created on the drawing (*.tvg) with the updated palette, the zone colour change would not be registered. Now that the Utransform searches for the Palette List before rendering, this is no longer a problem. 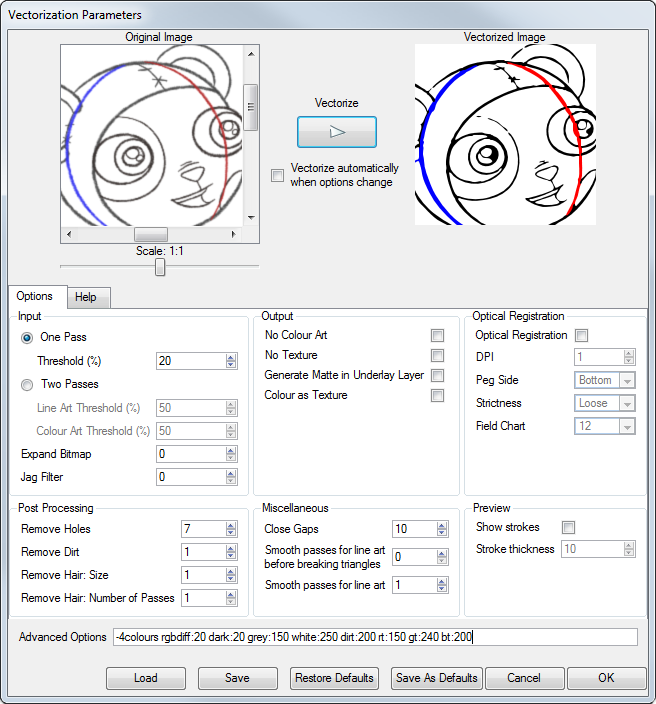 Use the Vectorization Parameters dialog box to vectorize your pencil drawings, along with any red, blue or green pencil marks that you may have used to indicate highlights and shadows. The system will vectorize the drawing into pure red, blue, green and black (RGB values), while creating colour art zones wherever lines connect. 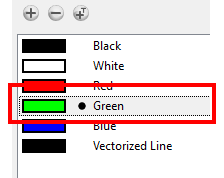 After painting in your tones and highlights, change your pure RGB colours to transparent (0 Alpha) in the Colour Picker window and watch the indicator colour zone lines disappear. ‣ Press [Ctrl] + [P] (Windows/Linux) or [⌘] + [P] (Mac OS X) to add a new peg module to the Network view and automatically connect it to the selected modules. • Use the “Group selection with composite” command from the Timeline, as well as grouping other effect modules in the Network, such as the Colour Override, without worrying that the Group’s inport will appear blue instead of green in the Network view. • Export a QuickTime movie with sound of a different sample rate than the original scene, for example 48khz to 22 khz, without the worry of unwanted clicking noises. • Quake module now renders out. • No longer an error handling for unreadable Preference files. • tbprocess on Mac no longer dies, so that batch rendering can occur. • Different gradient tags update when colours are picked from the multi-wheel Colour Picker. • Use of 3delight and Pixie scripts now functional on Windows. • Scenes containing imported PSD in layers no longer crash on close. • Integrated Help in the Network view no longer opens with a double-click.